Are you getting ready to start a WordPress blog and want to know just how much it’s really going to cost you? Knowing how much a website really costs ahead of time, no matter what kind of website you’re about to launch, will save you lots of time and money. If you’re looking to take the DIY route and opt out of hiring a professional to build and design your website (which will save you lots of money), it’s helpful to know what you’ll need to get started. Your domain name is the URL (or website address) on the internet that appears in the browser of people’s computers. It’s also what people click on in search results when they want to access your website. Some examples of domain names include Amazon.com or WPForms.com. If you want to use a specific domain name for your website, you’ll need to register it. This registration will last for one year. If you want to keep using the same domain name, you’ll need to keep registering it each year in the form of a domain name renewal. If you decide you don’t want to use that domain name for your website at any time, all you have to do is let it expire. This then frees up that domain name for someone else to register and use. There are many domain name extensions to choose from including .com, .org, .net, .co, and .org. There are also extensions reserved for websites in specific countries. For instance, citizens or entities in the United States can use the extension .us to signal to site visitors they’re based in the United States. Whether you’re new to website building or have a ton of experience, you’ll need to use a website builder to create a website. And the great thing is, website builders make building websites easy for people of all skill levels. They also allow you to add features for design and functionality so your website stands out and works properly. We always recommend using self-hosted WordPress as your website builder. The WordPress platform powers over 30% of all websites in the world. It also gives you the flexibility to customize your website in any way you want, and maintain complete control too. WordPress is a free and open source software. That said, to use self-hosted WordPress, you’ll need to buy a domain name and get web hosting. This way you can install WordPress and build your website on top of it. Web hosting companies store the files of your website and deliver content to site visitors when they click on your site. In other words, when a site visitor clicks on your website’s URL or types your domain name into the browser, they’ll be directed to the files your web host is storing for you on their server. Web hosts also help maintain internet connectivity and access to your website so people can always view your site no matter when they visit or where they access your site from. Shared Hosting: when your site’s files are stored on a server, along with a bunch of other website files. Everyone shares resources so the cost of shared hosting is usually low. If someone’s website goes down or uses too many resources and causes a strain, your site may be affected. Virtual Private Server (VPS) Hosting: similar to shared hosting. All sites are hosted on one physical server, but the server is then split into multiple virtual servers so resources don’t have to be shared by site owners. This reduces downtime because your site isn’t affected by other website’s overuse of resources. It also makes scaling your business a cinch, though there are some limits because of the physical server. Dedicated Hosting: for large businesses that need their own physical server to store all their site’s files on. They comes with a set amount of resources, albeit a large amount, and cannot scale like cloud-based VPS hosting. You do have lots of control over the data, software, and hardware though. Cloud Hosting: much like VPS hosting, cloud hosting is easy to scale. The difference is, there’s no need for a physical server since all resources are based in the cloud. This means there is an endless number of resources available. 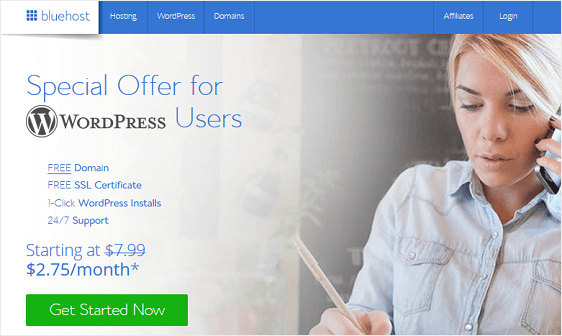 WordPress Hosting: shared hosting for WordPress users. WordPress comes pre-installed on your hosting account and may come with additional services such as automatic updates, built-in security measures, and regular site backups. But first, let’s look at some things to think about before you build a website. Before you jump into building a website, it’s important you have a plan in place so you don’t overspend. Here are some things to consider before building your site, choosing a web host, and deciding which WordPress plugins to install on your site. Knowing how much money you realistically have to spend on a website will help guide you through the site-building process. Before making any final decisions when it comes to spending money, double-check your finances and make sure you can afford it. Oftentimes there are other ways to spend less and get the same functionality and design. 2. What features will you need? After determining your budget, it’s time to figure out what type of website you plan to build and what features you’ll need to achieve your goals. Create a list of must-have features and put aside the features that can wait until you start to turn a profit or something changes with your budget. This will make site building easier, faster, and less stressful. You can always add more to your site as it grows. 3. Do you need to hire a professional? Sometimes you might think you can build a website all on your own, only to realize later that you actually need a custom build. If you’re in need of a custom theme, and a website that performs in a very specific way, you might need to hire professional designers and developers to help you. Rates for a WordPress developer vary widely, ranging anywhere from $20 to $100 an hour. Make sure before you hire someone that you cannot achieve your goals on your own. That way you don’t overspend on a site build when you don’t need to. Building a small website doesn’t cost a lot of money when compared to building a large advanced website or an online store. That said, for those just starting out, even the cost of registering a domain name and paying for web hosting can be a little pricey. A domain name will usually cost you around $14.99/year. A decent web hosting plan will cost about $7.99/month. That means that to start a small website, you should expect to pay about $110.87 a year to keep it running. Luckily, we’ve struck up a deal with Bluehost to offer website owners a free domain name, free SSL certificate for added security, and over 60% off on web hosting services. Bluehost is an officially recommended hosting provider by WordPress.org, making it one of the best options when it comes to web hosting. It has been with the WordPress community since 2005 and is one of the largest hosting companies in the world. With things like 1-click WordPress installations, 24/7 customer support, and reliable site performance, Bluehost is a great option for those on a budget looking to start a website. After you’ve secured a domain name and web hosting, you’ll need to ramp up the design and functionality of your site. Luckily, you can do this using free WordPress themes and plugins. WPForms Lite: build a contact form and keep in touch with site visitors. MonsterInsights: connect your website to Google Analytics and make data-driven decisions to grow your business. UpdraftPlus: perfect for scheduling routine backups of your site and restoring with one-click. W3 Total Cache: improve the speed and performance of your site, as well as the user experience. Yoast SEO: optimize your site for SEO and rank higher in search results. If you need more features to design your website, grow your following, and create a better user experience, check out our roundup of the best free WordPress plugins for this year. If you need to build a site with more advanced design and functionality than most free WordPress themes and plugins offer, you’ll need to make some changes and allot more of your budget to site building. To start, you might consider investing a more powerful hosting provider such as SiteGround. You can use our SiteGround coupon to get 60% off to purchase the Go Geek plan at a reasonable price and enjoy things like free backup restores, improved speed and performance, 1-click WordPress staging, and the ability to handle 100,000 site visitors a month. You might also want to purchase a premium WordPress theme that has extra built-in features, a more professional appearance, and priority support. WPForms: use the drag and drop form builder to create forms of all kinds, including contact forms, order forms, surveys and polls, and more. MonsterInsights: connect your site to Google Analytics and evaluate data about your site visitors. SeedProd: as you build your website, use SeedProd to display a Coming Soon page. Plus, gather emails before your site goes live. Beaver Builder: turn your WordPress website into a page builder to change the entire layout of your site and customize it to meet your needs. Envira Gallery: create responsive photo and video galleries. CSS Hero: change the design of your website without touching a single line of code. OptinMonster: take your lead generation efforts up a notch by creating compelling optin forms and using features such as Exit-Intent® technology, page level targeting, and list segmentation. Constant Contact: as one of the best email marketing service providers around, Constant Contact can help you grow your email list, manage subscribers, even integrate with the lead generation software OptinMonster. For more ways to grow your business, check out our roundup of the best WordPress lead generation plugins in the market. Sucuri: this plugin has one of the most effective web application firewalls to protect your site against hackers, DDoS attacks, blacklist warnings, brute force attacks, malware threats, and more. BackupBuddy: create backups of your site right in the WordPress dashboard, store files in safe, offsite locations, and restore your site with just a few clicks if need be. This is a just a list to get you started with site creation. You can add many WordPress plugins to your site depending on your needs. Just remember, for every premium plugin you add, the cost of building your site increases. In the end, building an advanced website can cost you anywhere between $500 and $1000 a year. If you’re looking to build an eCommerce site, now is as good a time as ever. You can reach a broader audience by going global and get started without spending near as much as someone trying to open a brick-and-mortar shop. To start an online store, you’ll need a domain name and web hosting, just like any other type of website. That’s why we recommend using the Bluehost WooCommerce plan when starting out. 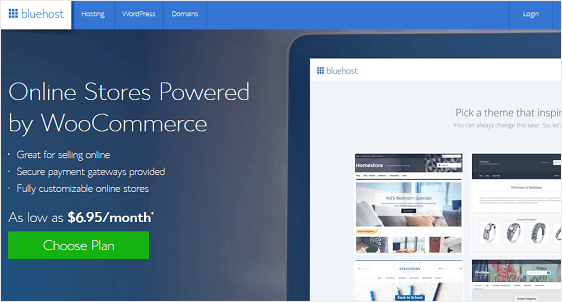 When you use a free eCommerce platform like WooCommerce, and utilize web hosting from Bluehost, you can expect to shell out approximately $190/year to get started. If you want to install premium WordPress plugins and themes or extend the functionality of your site using premium WooCommerce addons, the price of your site will increase. When it comes to building your first website, no matter what you overall goals are, it’s best to start small and spend more later. It’s also helpful to keep an eye out for deals and discounts on premium WordPress themes and plugins to save some money when a premium solution is necessary. And don’t forget, as your site grows and you begin to scale your business and generate more revenue, make sure to optimize it so it renders seamlessly for site visitors. There’s no sense putting all your hard work, effort, and money into building a website that customers don’t enjoy. And there you have it! You now know how much a website really costs, regardless of the type you want to create. If you’re looking for ways to promote your website once it launches, check out this roundup of marketing ideas for small businesses. So, what are you waiting for? Build a WordPress website and get started with the most powerful WordPress forms plugin today. Wow !!! Incredible info… Thank you so much. Wish I’d read this before getting started developing a WP blog site! None of the other resources I’ve been using have been as forthcoming or straight up informative about the REAL costs of starting a blog. They all made it seem “cheap” and “easy.” “Easy” has definitely NOT been my experience, and “cheap,” well, let’s just say the costs keep adding up. Also, the structure of this post is a useful model for writing posts that are intended to be a guide or how to do something (what I’m working on right now) — a delightful realization! It’s also encouraging to know that I’m already using several of the plugins and products you recommend. Thanks for this clear, direct, helpful overview. If I ever have the opportunity to do so, I will refer others to your post. Meanwhile, I’ll share via Twitter and LinkedIn.